Lamberts Quercetin 500mg, Uses: bioflavonoid helps with allergic symptoms, antioxidant action and important for cardiovascular health. Quercetin is a bioflavonoid that stabilizes the membranes of the cells that release histamine, which triggers allergic symptoms. Quercetin is probably most well known for its antioxidant action. More recent studies have demonstrated the importance of quercetin in cardiovascular health. Quercetin is one of the most active flavonoids, with many medicinal plants owing much of their activity to their high quercetin content. It has been shown in experimental studies to have numerous effects on the body including the inhibition of both the production and release of histamine. However, it is probably most well known for its antioxidant action, with more recent studies also demonstrating its potential for contributing to cardiovascular health. 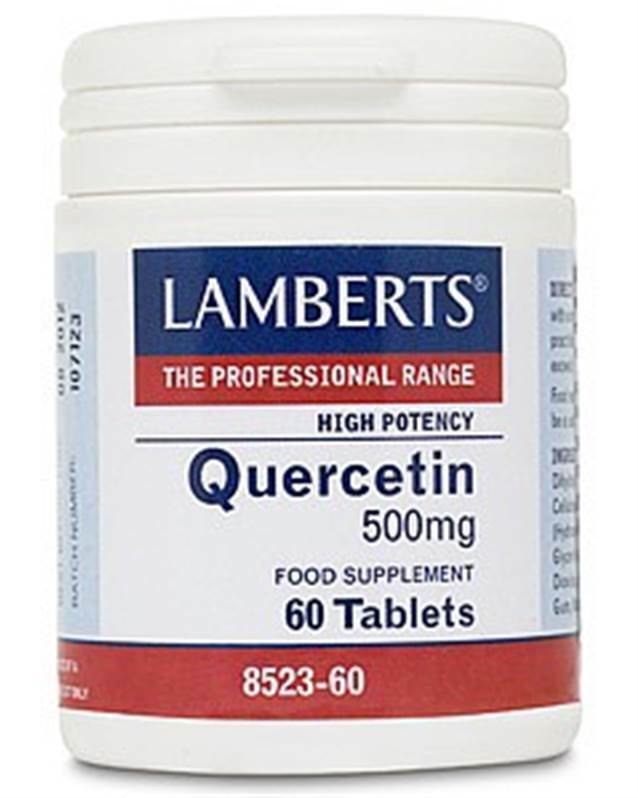 Lamberts® quercetin is extracted from a plant source and our tablets provide a full 500mg of pure quercetin. Cheap quercetin products, particularly those imported from the USA, may contain much less quercetin than the label declaration, as the weight being given refers to the plant extract, not to the quercetin content. Quercetin is found in many fruits and vegetables, with apples and onions contributing most to the typical UK diet. Each 500mg tablet provides significantly more quercetin than 1 kilo of apples. Calcium Carbonate Cellulose Tablet Coating (Hydroxypropyl Methylcellulose Glycerin) Stearic Acid Silicon Dioxide Crosslinked Cellulose Gum Magnesium Stearate.